We will offer you a complete ‘meet and greet’ service once you arrive at your destination. We will transport you to your hotel and then take you back for your flight home. 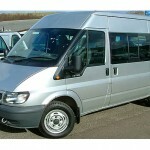 Transport may be by minibus, car, coach or limousine.